Anyway, moving on…. 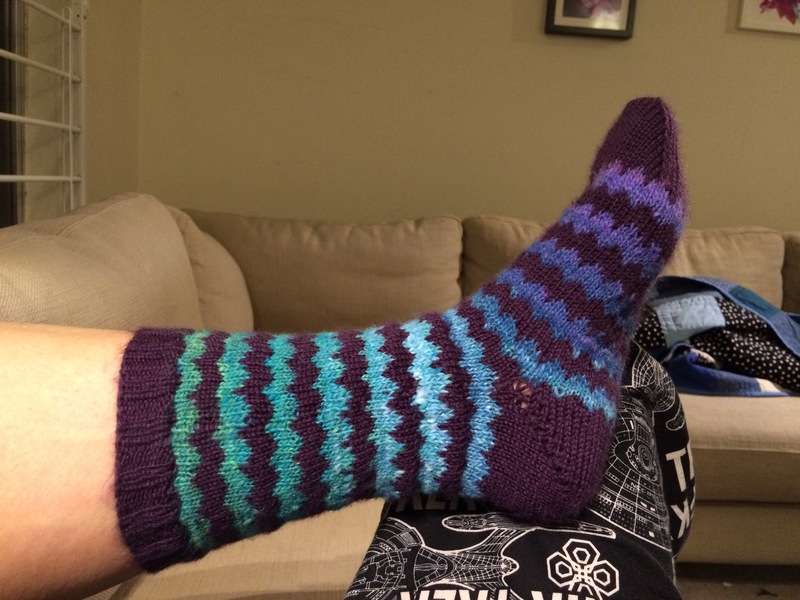 tonight I am so pleased to announce that I have finally finished the socks requested by my husband back in…. (runs off to check Ravelry) January! 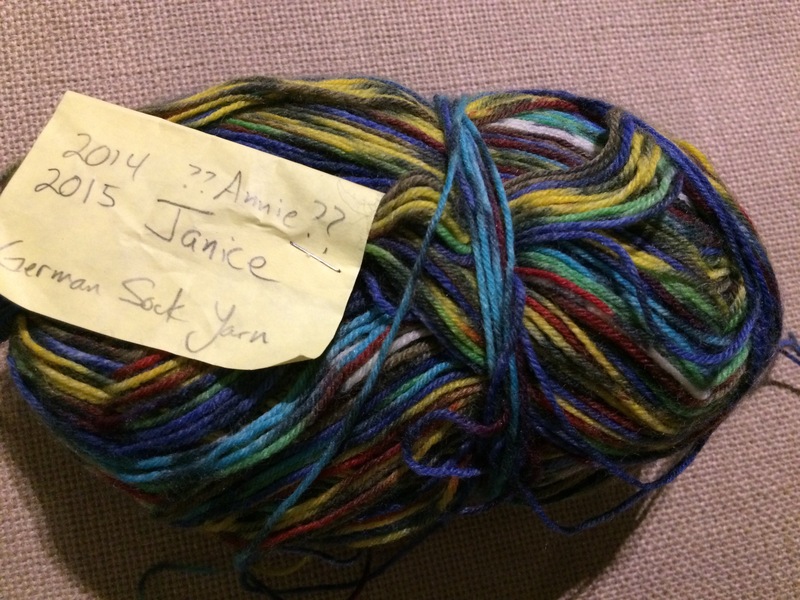 Maybe even earlier, because he chose the yarn from Webs, and it had to ship from Massachusetts, blah, blah. This is the only yarn from Stash Exchange 2015 that I haven’t used yet, and my personal goal was to use all my stash exchange yarn (at least use some of each skein) by this year’s exchange. I’m cutting it close! I also have the personal goal of not letting repeat offenders return to the stash exchange. So this skein really needs me to knit it up! I’m thinking toe-up to make the best use of the yardage, and simple stockinette so whatever pattern emerges (if any pattern emerges at all) will show. Wish me luck! 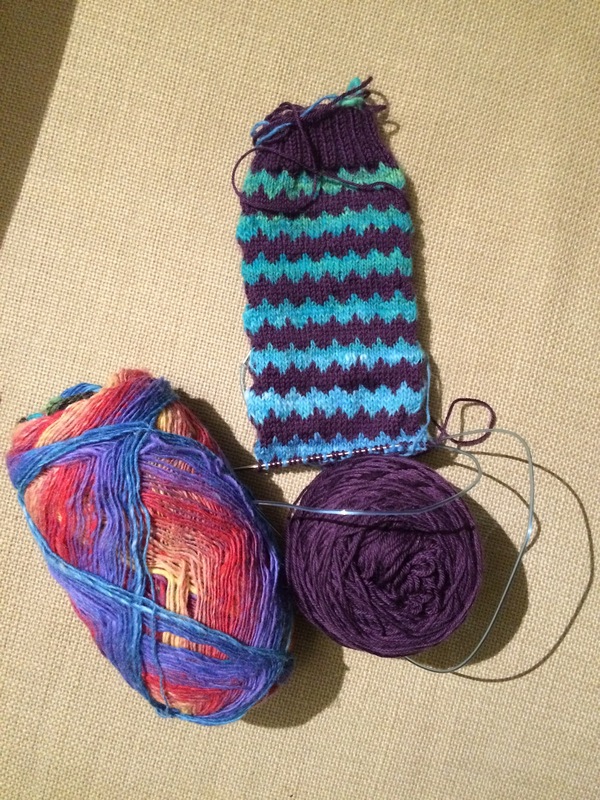 Today I made a little progress on my second Ziggy Plays Guitar sock. 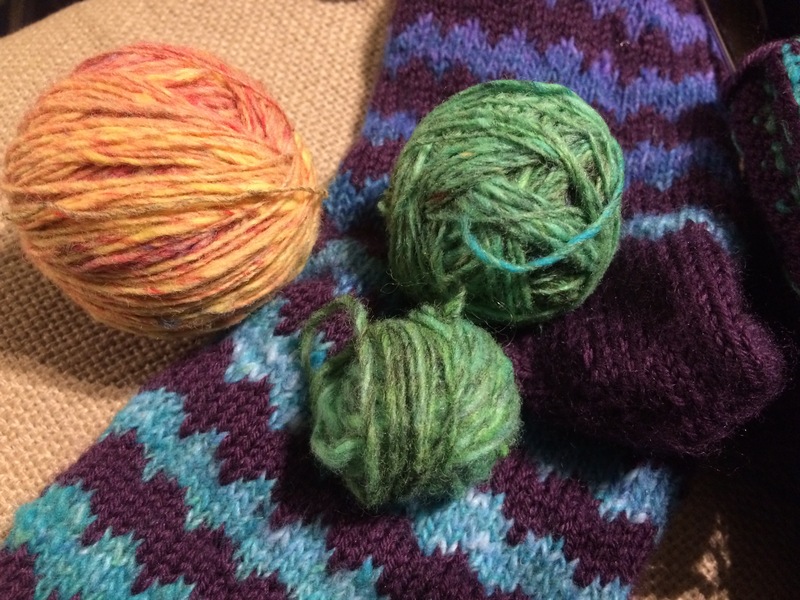 It isn’t easy trying to match up Noro yarn, especially when you’ve taken out large sections. 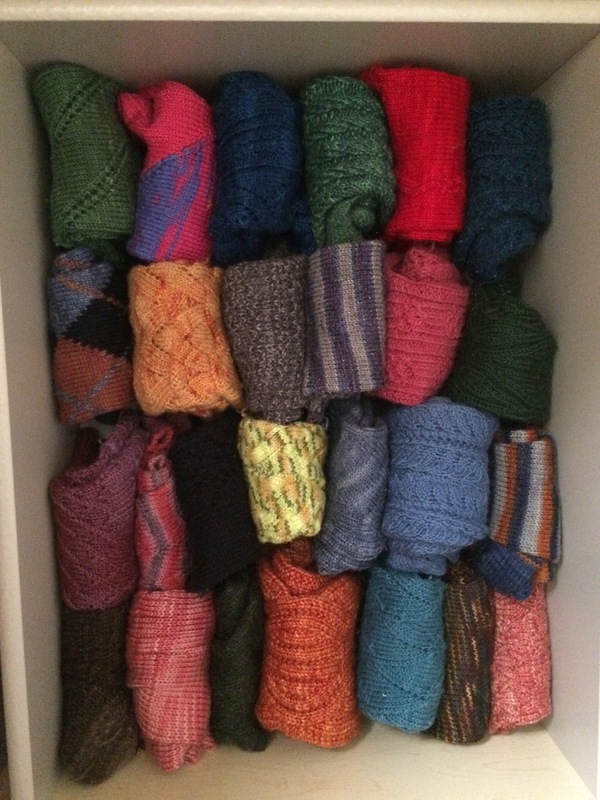 Today I also had the chance/reason to organize my drawer of hand knit socks, which is always a pleasure. 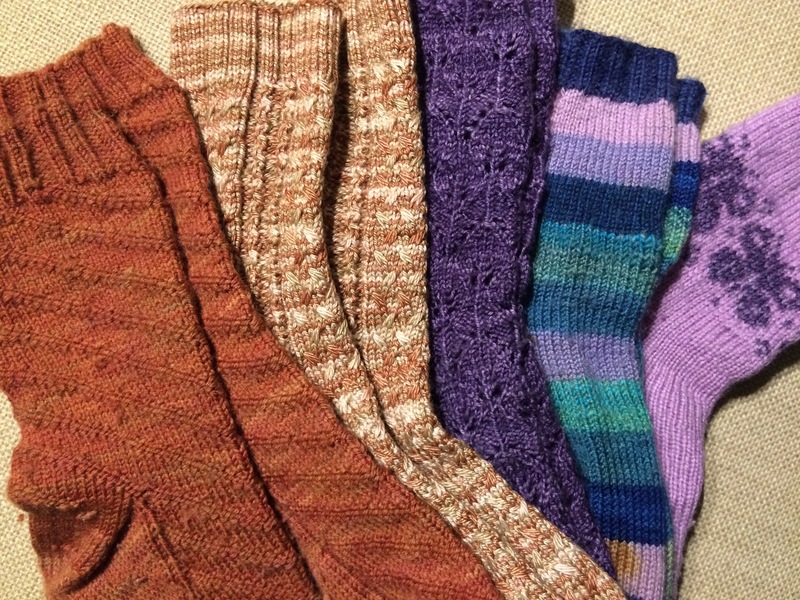 I counted ten missing pairs, which are either in the mending pile or drying. 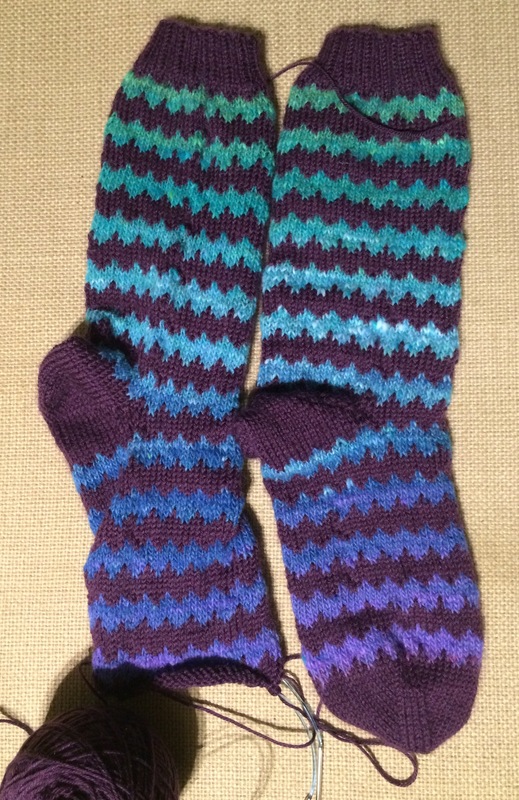 I might have to start knitting socks for others….. I finished my first Ziggy Plays Guitar sock! 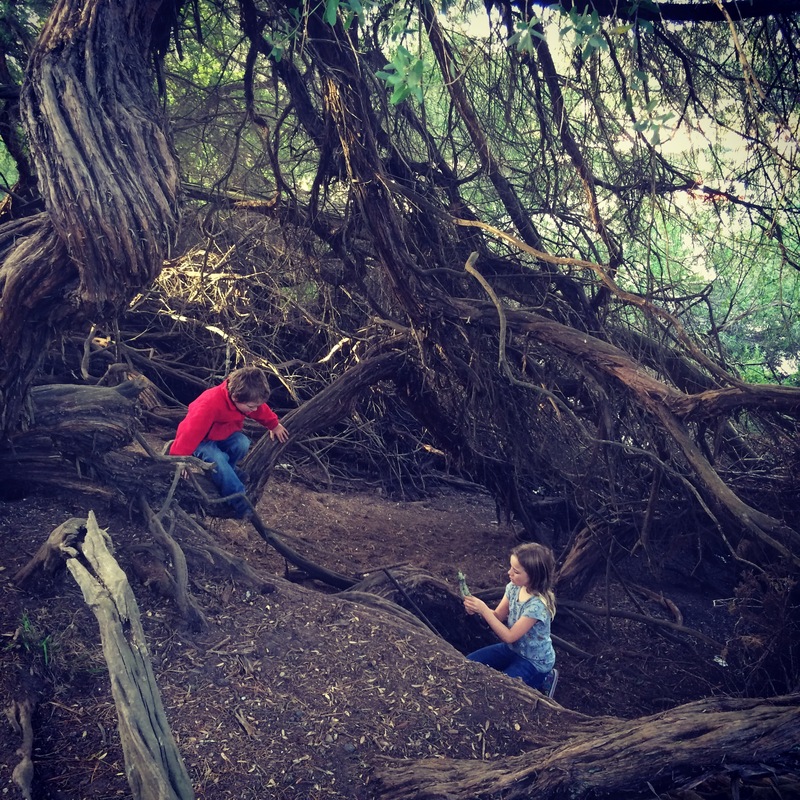 Oops, didn’t hit “publish” last night, which explains my two posts in a row. I’m nearly at the heel! The changing colors really keep me going. I only stopped because I need to finish my spinning project. 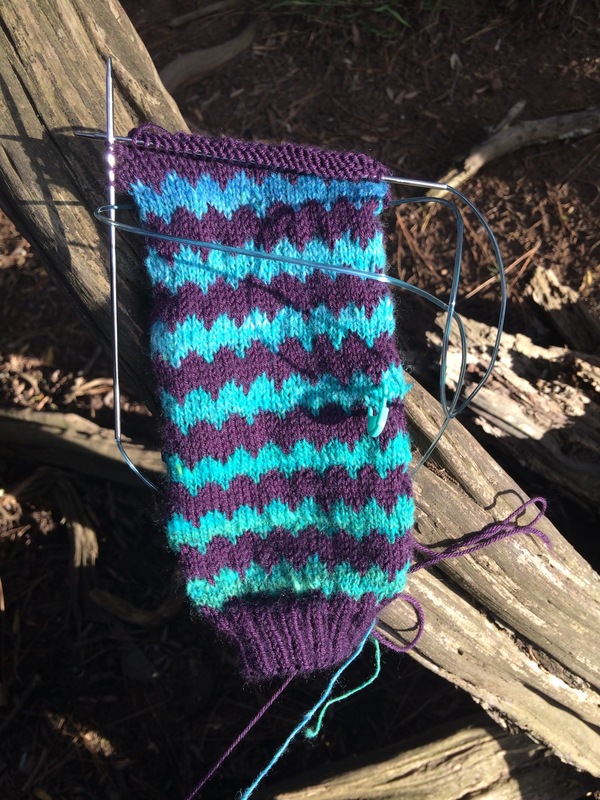 Thankfully, the pattern calls for a short-row heel, so the rainbow-y gradation won’t be interrupted. 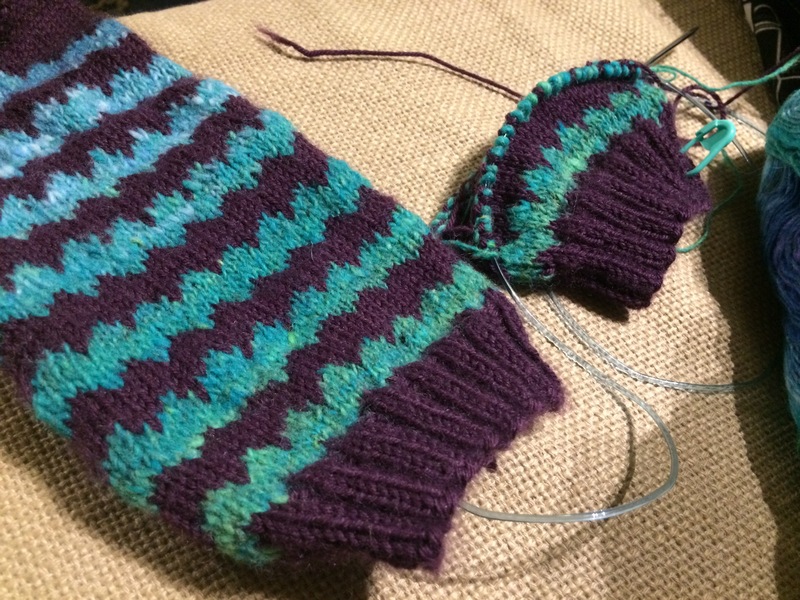 My challenge was to start the heel before I reached the purple on the Noro, so the heel would stand out. A few minutes ago, I finished my Crazy Hat #5, made from a purple/gray crazy ball. It’s fun to reminisce about the various yarns: the brim was a thrift store sweater I unravelled (9 years ago! 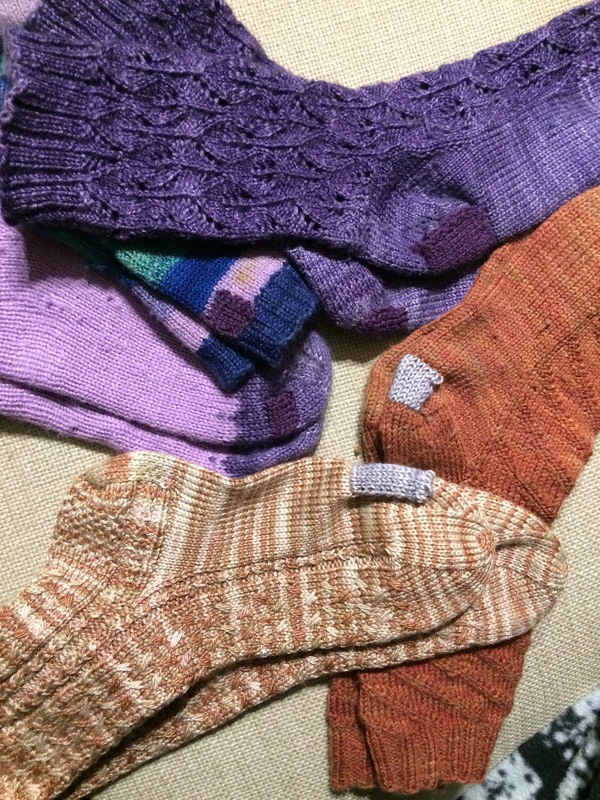 ), the light gray was one of my first hand spun yarns, the plum is leftover Mad Tosh from the Wee Girl’s Tiny Tea Leaves cardigan, I have no idea about the purple, and the top was leftover from a Cairn hat. Although this is Crazy Hat #5, it’s #7 overall in my hat knitting for the Larkin Street Youth Services. I added two hats that I thought I had knitted for myself, but never, ever wear, that someone else might be happy to own. This brings me to almost half of my goal of 15 hats in 2015! I think I’ll take a break for a bit and cast on some different projects to spice things up. I may not have mentioned this next project, because it’s not that interesting. It’s a pair of socks for the Wee Girl. This is stash exchange yarn, and I’m not that thrilled with it (it’s splitty, the color isn’t fantastic), which keeps me from wanting to work on these. Therefore, they’re going pretty slowly! She’ll be happy with them, though, and that keeps me going– slowly, slowly, but surely. The sunsets in San Francisco have been lovely these days. I saw so many different, amazing versions in my Facebook feed tonight that made me wish I had more of a western rather than northwestern view from my kitchen window! Although seeing the sun set behind the Golden Gate Bridge isn’t that bad. And check out that fog coming in! This view makes washing the dishes less painful, I’ll tell ya.